University of Redlands English Professor Sharon Oster recently published her first book, No Place in Time: The Hebraic Myth in Late-Nineteenth-Century American Literature (Wayne State University Press, 2018). In the book, Oster highlights how Jewishness has been represented in American literature as a metaphor for an ancient, pre-Christian past, how the “Hebraic myth” was reimagined in American realist writing, and how this pattern raises questions of identity, immigration, and religion. Oster sat with Mika Elizabeth Ono of the Bulldog Blog to talk about her inspiration for the book and how her findings speak to today’s world. Mika Ono: Can you tell us what inspired you to write your new book? Sharon Oster: My goal for the book had to do with a frustration with the way that Jewish American literature is often discussed and taught separately from American literature more broadly. When I conceived of this project, therefore, I started to think about how depictions of Jewishness by Jewish and non-Jewish writers of the same period needed to be analyzed together. This is because the writers I was examining—Abraham Cahan, a Lithuanian-born Jewish immigrant; Henry James; and later, Edith Wharton and others—were writing in the same cities, publishing in the same periodicals, with the same editors. They traveled in overlapping circles, and many of them knew each other. The main point I wanted to make was that, in this period around the 1880s and 90s and the turn of the century, these writers were in the same literary market, climate, and culture. They inherited a similar set of conventions for writing about Jewishness, and they influenced each other. MO: Do you think that complaint applies to many periods and ethnicities of scholarship? SO: I do. This particular period is when immigrant and ethnic fictions were starting to be marketed as such, except that’s not what they were called. Some of these writers were marketed as “local color” or “regional” writers, and that kind of writing was actually emerging as a popular genre of literature. This was primarily due to the work of William Dean Howells, one of the prominent editors of the period. He helped writers such as Cahan and Charles Chesnutt to start their literary careers alongside Henry James and Mark Twain, and naturalists like Stephen Crane and Hamlin Garland. So this was the beginning of both the inclusion and marginalization of ethnic writers. Although Jewish writing has long been discussed as “ethnic,” I follow the religious tropes of Jewishness in the book. Until fairly recently, discussions of religion were not so popular in literary studies. Rather, literary critics regarded a trend toward secularization as key to the modern, industrial world and its literature, but now we can look back and see that religion has not gone away. I wanted to put Jewish writers, who were trying to define Jewishness within a Protestant American context, in conversation with those who were not specifically writing about God or religious themes, but who lived and wrote in that same context. I look at the religious tropes carried through into the period of realism in a way that critics and scholars haven’t noticed because they just assumed that the realist novel was not religious. MO: Did you make additional findings as you worked on the book? SO: Once I started thinking about religious tropes, rather than ethnic or racial ones, I started wrestling with the fact that Jewish representation in literature is often antisemitic. Many studies that point to the racist antisemitism of authors or their “ambivalence” toward Jews end there. But what does that mean? That we don’t read those books anymore? I wanted to find a different way of talking about literary Jewishness that was less about whether or not authors had racist or antisemitic feelings, and more about how, when viewed from within a religious framework, they cast Jewishness and Judaism as belonging to the ancient past. For example, Edith Wharton reproduced antisemitic stereotypes that are easily identifiable. That’s an obvious critique of her texts. But one key Jewish character in her novel The House of Mirth also has redeeming qualities and plays a vital role in the plot. Scholars have concluded that it is a result of her ambivalence, but I found that totally unsatisfying. This mixture of antisemitic stereotypes with reverence for Jewish figures is not just random ambivalence—it has a history. Antisemitism and philosemitism (the so-called reverence for Jewish people) often go hand in hand. I traced the American roots of these phenomena to a particular religious past founded in Puritan culture, in which Jewishness was revered—but only as a predecessor to Christianity. The Puritan settlers imagined themselves as superseding God’s original “Chosen People”: they were the “New Chosen People,” and they saw America as the “New Jerusalem.” American literary culture then continued to be shaped by this logic. Even in the late-19th century, the trope of the noble Jewish figure never really goes away, but it becomes disconnected from actual Jewish people, now immigrating to the United States en masse. It becomes a myth recycled over and over—even in this period of so-called secular writing. MO: How do these studies speak to today’s world? SO: The reality is that Jewish people are a tiny minority of the population of the world and a tiny fraction of the population in the United States (something less than two percent). Yet what I’ve been able to see is that, even though Jewish people have had a miniscule actual presence, Jewishness and Judaism as a religion have (like other targets of racism) figured large in the American literary imagination, and are arguably fundamental to the concept of American identity. This imagined presence is out of proportion to the number of actual Jewish people in the population. We still see this today, for example in the racism and antisemitism prevalent now—what happened in Pittsburgh and other violent incidents. It’s hard to comprehend the motivation for racist, violent acts targeted at any specific group. But we must recognize how, even when coupled with relatively positive ideas about a group, myths that identify and radically distinguish “others” can take on a reality of their own, and lead to violent outcomes. The book is focused on a particular era, and it's very much about literary realism and particular writers. But I hope that I make evident in the introduction that this kind of mythical thinking about Jewishness, even the most positive version, is still alive and well, and that even the positive myths can be problematic, because they neither correspond to reality nor allow for a full accounting of living, breathing Jewish culture. MO: Are some of these tensions between myth and reality a common problem for any identifiable minority group? SO: Definitely. This is not unique to Jewish people. As I already mentioned, once stereotypes get formed, they take on a life of their own, and they begin to influence reality. We’re seeing this right now at the southern U.S. border, where dehumanizing stereotypes that have been circulated about people from Mexico and Central America have become real in the sense that U.S. military force is being used to harm and imprison innocent people seeking asylum. Each group may be perceived through different myths, springing from different histories, but the dynamic is the same. MO: What is the relationship of your scholarly work and your teaching? SO: I’ve taught both Jewish and non-Jewish writers in my courses in late-19th-century American literature, and have developed courses that include multiple voices representative of the literature of that time period. My scholarly work definitely informs how I teach, as I think about innovative ways of integrating this discussion of religion into my classes. MO: How about the other way, students influencing your work? SO: That applies much more to my current project on Holocaust literature, which has grown entirely out of my teaching at Redlands. My research focuses on a particular figure seen in so many Holocaust survivor memoirs, one that students always ask about, write about, and want to spend a lot of time discussing. This is the figure of the so-called “Muselmann,” which refers to those concentration camp prisoners who are closest to death and often get described as the “living dead.” Students get very fixated on that, and it's troubling and difficult to teach and talk about. So I started exploring current research on this figure and discovered surprisingly little. I have since published one article on this subject in the journal Prooftexts and am in the process of completing two more, all contributions towards a longer book manuscript. I have the students to thank for this effort. They pushed me to go deeply into the topic. MO: You had a joint book party in Los Angeles. What’s the relation between you and San Diego State Professor Angel David Nieves and his new book An Architecture of Education: African American Women Design the New South? SO: Angel is a friend and colleague whom I met in a National Endowment for the Humanities workshop in spatial studies at the University of Redlands in 2012. From that time, we supported each other’s writing processes and our books came out within months of one another, so we decided to have a joint party to celebrate. Both books are in American Studies and American ethnic studies, and we thought it would be a great idea to introduce our respective colleagues to one another and generate mutual interest in our projects. Angel and I also worked successfully together on a seminar titled “Mapping Oppression” for the 2013 American Comparative Literature Association conference, and, given the proximity between our respective campuses, I hope to continue to work with him on digital humanities projects in the future. 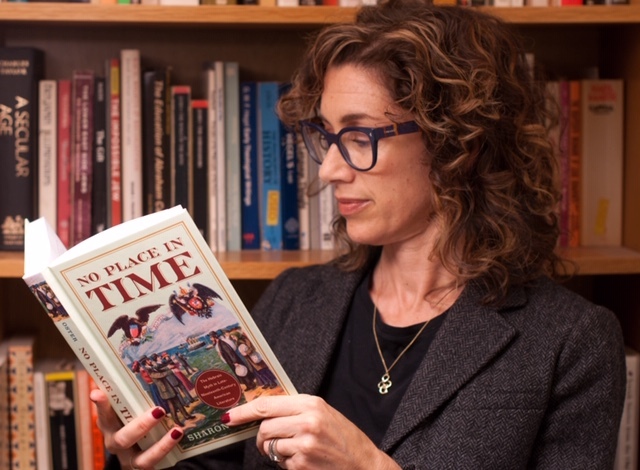 Learn more about Professor Sharon Oster, her new book No Place in Time, and the English Department at the University of Redlands.